The first solar eclipse of 2010 will take place today, January 15th. A great way to jump start the new year with a powerful, natural event. 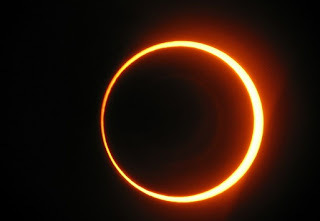 What is unique about this eclipse, is that it will be an "annual solar eclipse" which is different from a total solar eclipse given that the diameter of the moon seems smaller than the sun's diameter. This is because the moon is farther away from the Earth. The 11-minute show, at its peak, will mostly be seen by residents in Africa (where it begins), crossing over the India Ocean, and continues through China and other parts of Asia.